Hane Naoki 9P has staged a dramatic comeback against Yamashita Keigo 9P in the 66th Honinbo, taking the title match to a 7th game. Yamashita appeared to be on track to defend the title, which he took from Hane last year. 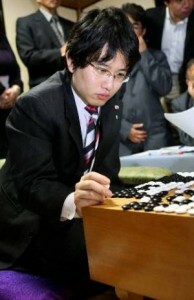 He won the first three games of the best-of-seven Honinbo final, needing only one more win to clinch it. However, Hane fought on to win the next three games, leaving the series tied at 3-3 on July 14, 2011. Hane would now appear to be the favorite to win the tournament. Typically players who come back from three down in a title match go on to win the title. Hane himself did this against Takao Shinji in the 63rd Honinbo (2008). One notable exception to this trend is the 28th Kisei in 2004, where Yamashita’s attempted comeback was derailed by none other than Hane Naoki. With the history between these two players, the final match promises to be exciting regardless of the outcome. The decisive 7th game starts at 8:00pm July 19, US Eastern Time and will likely be completed the following day. - David Ormerod; based on his original report: Hane Naoki fights back in 66th Japanese Honinbo at Go Game Guru. Photo: Yamashita Keigo 9P (left), Hane Naoki 9P (right), Ishida Yoshio 9P watches (standing back-center).